You’re off to a great start in Congress! You’ve clearly established that you’re independent minded and that you vote your conscience. I expected that you would act in this way and that is why I supported you during last year’s election campaign. We need more people like you in Congress. As you perhaps know, I am a non-ideological fiscal conservative and social moderate. I am, like you, mainly interested in finding practical, workable solutions to difficult and complicated problems. But I do have one guiding principle to which I strongly adhere. I believe that, as a general rule, every level of government should refrain from spending more money than what it can pay for with tax revenue. Unfortunately our federal government has gotten away from this principle in recent years. 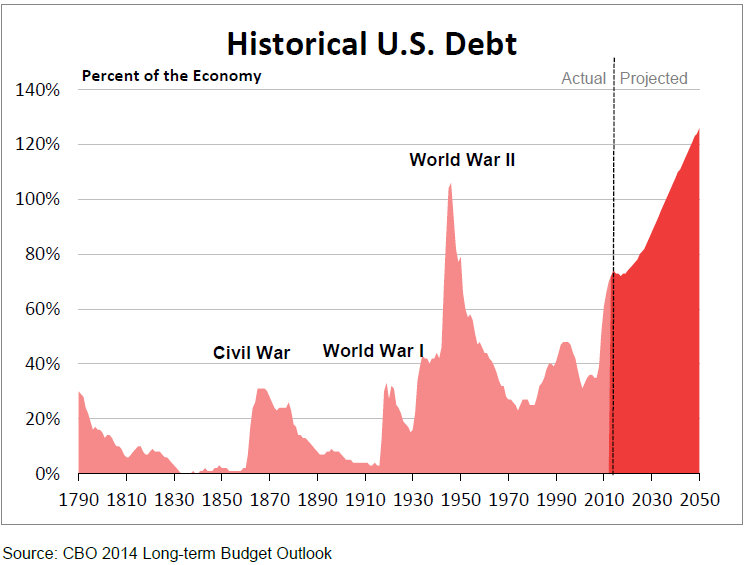 This is clearly demonstrated in the above chart which shows an already very large national debt getting much, much worse in the coming years. There is a movement in the new 114th Congress to address this perilous situation which we have gotten ourselves into. I am referring to the bills drafted by the Budget Committees of both the House of Representatives and the Senate which would produce balanced budgets over the ten year period, 2015 – 2025. It was reported in today’s Wall Street Journal that the full House voted yesterday to approve the budget bill by a 228-199 margin but without any Democratic votes. This means that either you voted against the Budget Bill or you did not vote on it. I don’t believe that any one vote is so important that it constitutes a decisive litmus test determining my support of a candidate in a future election. However, as I mentioned above, I feel very strongly that we must greatly shrink our very large budget deficits and that now, not later, is the time to get started on this urgent task. I hope to be able to support your re-election campaign in 2016 and beyond. That is why I am writing to you at the present time.